There are so many different types of Kids Bibles available now compared to when I was a child. They have the very basic Bible with cute pink covers, Bibles covered with pink or purple glitter, and even some with fun animal shapes. There are Story Bibles and Devotional Bibles. With so many choices, Family Christian has the right Bible for you and your family. From December 5th until December 24 select Kids Bibles and Devotionals are 50% off! Almost all of the Kids Bibles are on a sale of some kind right now, but there are way too many to list them all here, I thought I would share a few of my favorites. I had a Beginner’s Bible when I was little, but it was nothing like this. This Bible is for 2-6 year-olds. Not only can they read the stories and look at the pictures, but they can listen to the stories! There is narration, music and sound effects for more than 90 stories. It has 512 pages and is hard covered, Originally $24.99 it is now on sale for just $9.99. When you look at the website it has a 5 star rating from everyone who rated it. Looking for something for a little girl? How about this amazingly priced Little Purse Bible? A great deal at the original price of $16.99, but a steal at the current price of just $5.99. It is not a full Bible, but it has all of the New Testament and Psalms and Proverbs. Great for a little girl who wants to carry her Bible to church. Is your child a little bit older and looking for a full Bible, but they still want some fun pictures and a little bit easier to understand vocabulary? Check out the Berenstain Bears Bible!It includes the entire Bible along with book introductions. a dictionary, larger font, and 18 full color pictures. This Bible looks like a fun transition Bible. It retails for $24.99 but is on sale for only $9.99. My all time favorite Bible, the Bible you see in all of the posts about AJ’s school work is the Deep Blue Kids Bible. It is not one of the Bibles on sale for 50% off, but it is on sale for 32% off. It retails for $18.99 and is on sale for only $12.99. It is an AMAZING Bible. It has notes, devotionals, trivia, reading challenges, and so much more. The version is easy to understand even for a struggling reader. No matter what kind of Bible you are looking for, Family Christian has you covered! Don’t forget to check out all of the wonderful sales that are going on now! 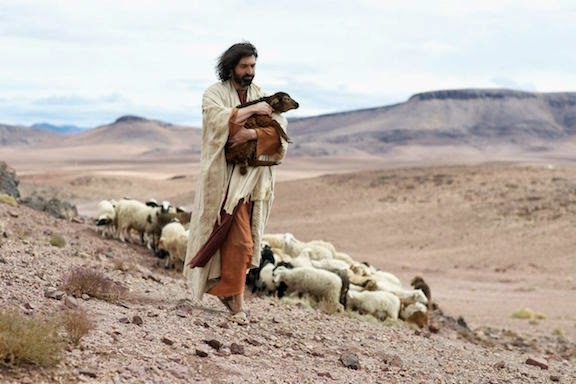 There have been a few different films made about the life of Jesus. Some I really liked others I never finished watching because I found them either too boring or too edited where they didn’t follow the Bible. 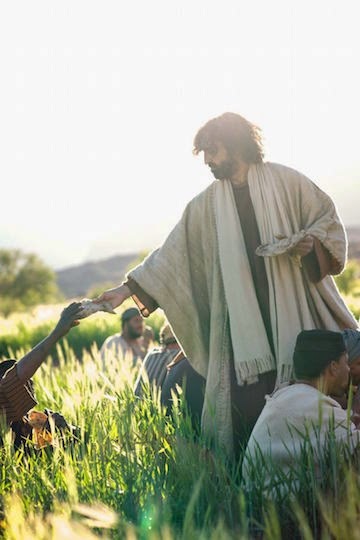 Recently I was given the opportunity to watch a new film from the Lumo Project called The Gospel of John, I didn’t know what to expect, but I really enjoyed the film. All four films are available on Netflix as of December 1, 2014. I was given a link to view The Gospel of John in order to share my opinion. The movie is long, a little over two hours and forty minutes, but it is well worth the time to watch. 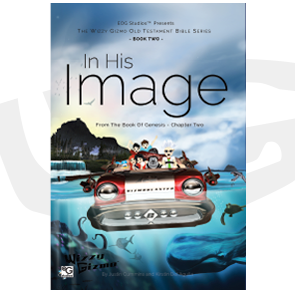 The film is available in NIV, King James, or Spanish narration. I chose the NIV version and I have to say, I was interested the entire time. The narration is word for word straight from the Bible, in fact a few times I looked up the verses in my Bible just to make sure. The narrator’s voice is inviting and his reading style really brings the story to life. One thing that I really enjoyed was the portrayal of Jesus. In so many movies they portray Jesus as a white man with light brown hair. While no one knows exactly what he looked like, I feel this film is more accurate. Overall I really enjoyed this movie. The only thing I didn’t like is that I don’t have Netflix so I won’t be able to watch the other three movies. If they are as well done and interesting as this video, I think they will be amazing as well. Learn more about the Lumo Project by connecting with them on social media! Wizzy Gizmo, the name itself is enough to bring a smile to your face. A few weeks ago I had never heard of Wizzy Gizmo, but that changed when I was recently given the opportunity to review a few products from the Wizzy Gizmo company. Actually Wizzy Gizmo isn’t a only a what, but a who. Wizzy Gizmo is a series of Bible books for kids, Bible audio dramas, Bible flashcards, and more. All of these are based off of a main character named, Wizzy Gizmo. The character Wizzy Gizmo is a genius inventor who loves God and loves to explore the Bible. 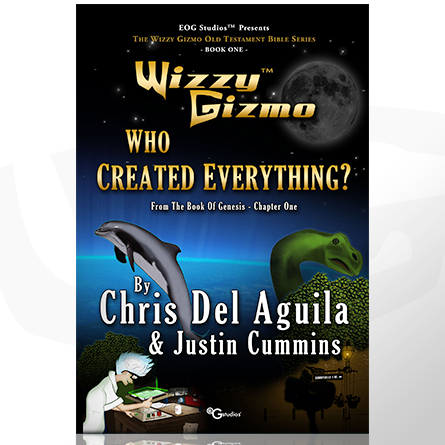 Currently Wizzy Gizmo has 2 books available, Who Created Everything? and In His Image. The first book, Who Created Everything? covers all of Genesis chapter 1. At first I thought that an entire kids book based of of one chapter in the Bible would be boring. The story has been done so many times before and in so many ways. But, Wizzy Gizmo is so much more! The story is fun and engaging, yet it doesn’t take away from the amazing Bible story. I love how the characters in the book don’t actually talk to Adam or Eve, they just listen in and watch them. The second book, In His Image, covers Genesis chapter 2. Both books have vibrant colors and engaging images that really draw you in. The books are very well done and explain the Bible in a kid friendly way without dumbing it down. I think the books are perfect and I really look forward to seeing more in the series. We were able to view a digital copy of the books, both AJ and myself thought they would be fun to read over and over. The books are available for $12.99 each. I am normal very frugal when it comes to books, but I think that these books are worth the price. Currently there is one audio drama available, Who Created Everything? The audio drama is absolutly amazing! AJ said it was like watching TV with her eyes closed. I honestly think that out of all of the products, that the audio drama was our favorite. It was way more than just an audio book.The music and the characters really bring the story to life. We were able to listen to a digital copy, and while that was great, I would recommend the CD and digital download option. It would have been nice to listen to the CD while we were stuck in the car running errands. The Audio drama is available as a digital download for $9.99 or as a CD and digital download for $14.99. The item that AJ and I received as a physical product was the New Testament Fast Track Bible Cards. It is a set of 27 double sided cards that are full of information all about the books in the New Testament. On the front of each card there is a summary of the book, the author of the book, the approximate date it was written, and the theme of the book. Then you turn it over and it lists the key people, key passages, key chapters, key doctrine, and an outline of the book. The cards are large and sturdy. They are easy to read and full of color, but best of all is the abundance of information. I have read the Bible all of the way through a few times but these cards really pull together everything and make sense. I love the timeline aspect and the theme on the bottom of the cards. How did we use the cards? AJ is working on the Old Testament right now, so we used the Fast Track Bible Cards to help get her familiar with the books in the New Testament. She looked up some of the key verses, practiced putting the books in order, and spent some time just reading the cards. According to the website the cards are perfect for kids up to 12, but I learned a lot from these cards and think that most adults would to. The cards are available for $14.99. Any of the Wizzy Gizmo materials would be a wonderful addition to any home school, church group, of family that is looking for a fun way to help kids get to know the Bible. The creators of Wizzy Gizmo have given me the opportunity to give away a set of the New Testament Fast Track Bible Cards. Enter the Rafflecopter below for your chance to win. Find out what other members of Home and School Mosaic thought by clicking on the disclaimer below. 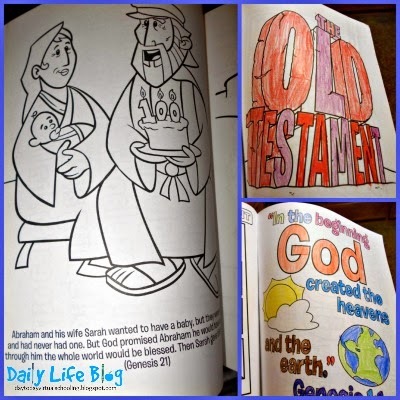 I was recently given the opportunity to review a fun new coloring book, What’s in the Bible. Since AJ and I have started our Bible study this year I have been looking into the DVD series by the same name. They look like a wonderful way to help kids really understand the Bible. After reviewing this coloring book I am even more interested in the DVDs. The What’s in the Bible coloring book has 200 reproducible pages, so it is the perfect coloring book for church groups, day cares, and homeschools. But it is way more than a coloring book. In fact I have found AJ reading it like a story book a few times. It takes your child from the beginning of the Bible to the end highlighting the main events, and reads like a story Bible on the bottom of the pages. Along with the main plot of the Bible there are pages that show different scripture verses, the books of the Bible, and characters from the What’s in the Bible DVDs. There were only two downsides to the coloring book that I found. First was the Bible version that was used. The verses used in the coloring book are all written in ESV. I personally think they picked a great kid friendly version, but I know that many people are particular. The second downside for me is the price. Currently you can get the coloring book for $14.99 at Family Christian. I think that is a little expensive for a coloring book for a single family, but if you planned on copying the pages then the $14.99 might be a good deal. Here are 3 Free downloadable coloring pages that are in the coloring book. 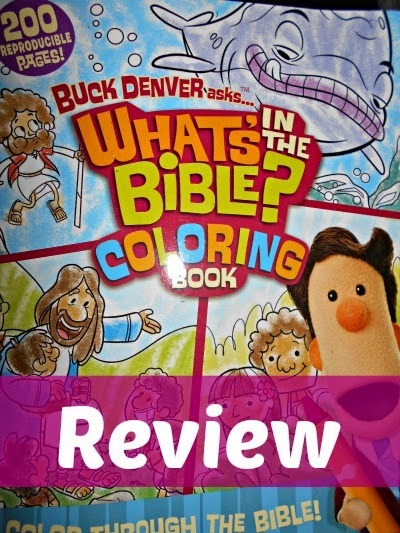 Overall I feel the What’s in the Bible Coloring Book is a great way to help kids learn more about the Bible in an entertaining way. 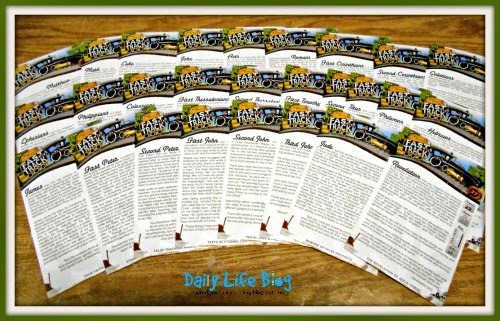 Family Christian has given me the opportunity to give away one $10 gift certificate to one of my readers. Enter the Rafflecopter below for your chance to win. 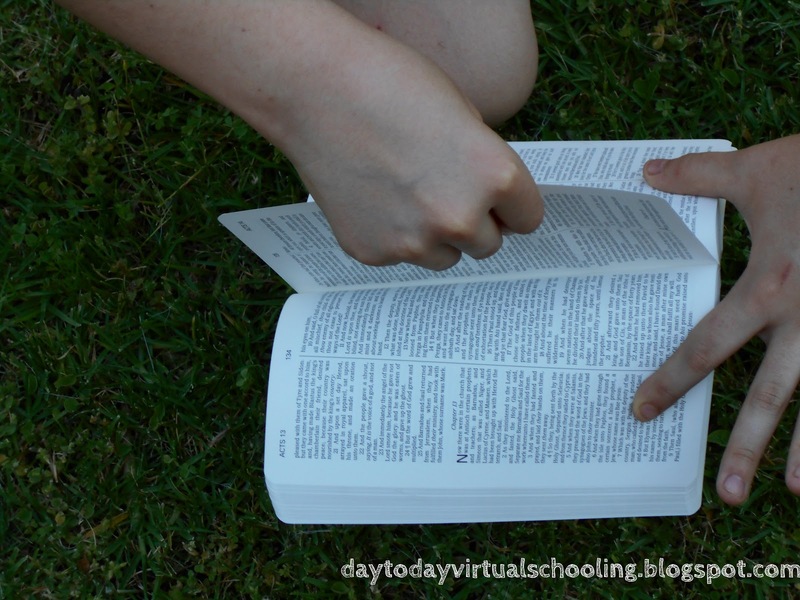 The Bible is something that needs to be a bigger part in our homeschool. This last year we looked up a lot of verses and learned a great deal, but AJ really needs more. Our history program this year is Bible based, and so is our science (more on those in another post) but I felt we needed a Bible curriculum. The problem I have with most Bible curriculum is that they are too religious and often there are things in them that we don’t agree with. After looking into a few different options I found a few that I couldn’t afford (really it needed to be free) and a few that just didn’t seem like a good fit. 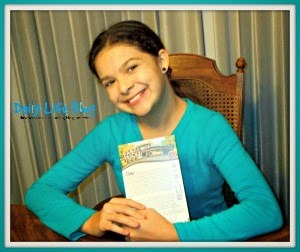 Then I was given the opportunity to review Bible Road Trip written by Danika Cooley. What is the Bible Road Trip? Bible Road Trip is a 3 Year Bible Survey for children and young adults, beginning in Genesis and progressing through Revelation. Year One covers the books of law and history in the Old Testament. Year Two covers the books of poetry and prophecy in the Old Testament. Year Three covers the New Testament. It is for preschool to adults with different assignments for each level; pre-K and K, grades 1-3, 4- 6, 7-9, 10-12. When I began reading the introduction to the Bible Road Trip I was pleased to find the following statement. I was very excited that this program might be the right fit for us. I kept reading and was ready to start our trip, then we hit a road block. I didn’t realize that in order to use the curriculum that we would need an additional book. The additional resources vary by grade level, but we needed, What the Bible is All About: Bible Handbook for Kids by Frances Blankenbaker. The book is used throughout all three years and from the previews it looks like an amazing resource, but it isn’t in our budget right now. So we looked over the curriculum and decided that with a little adjusting we could still use the Bible Road Trip. There are 32 weekly lessons to be completed however you choose. 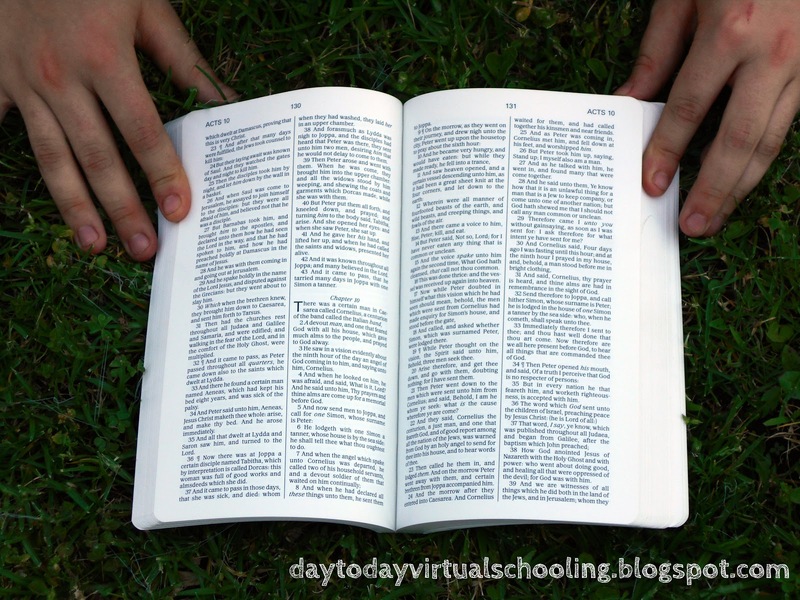 Each week there is a lesson guide that has suggestions for; Researching the Word, Reading the Word, Memorizing the Word, Notebooking the Word, Praying About the World, Learning More About the Word, and Crafting Through the Word. The Bible Road Trip retails for $20. To go along with the study there are also notebooking pages that are available for $20, but this week they are on sale for just $10. There are a lot of great ideas in the Bible Road Trip, and I think the notebooking pages are beautiful. For now we are going to put the study on hold, but we will be picking it up when we start back to school. We will be doing the reading, memorizing, and praying (hopefully weekly) and throwing in some of the crafts as time permits. I think the study will definitely be a great addition to our homeschool. We have now been using The Bible Road Trip for the last five months and we LOVE it. We were able to get a copy of the book we needed and the What’s in the Bible DVDs. AJ and I have learned so much. We love using the note booking pages to fill in the information that she learns. It is a wonderful program that is all planned out and easy to use. We plan to continue with it this year and to use year 2 next year. 101 Bible Stories from Creation to Revelation is a 217 page hardback story Bible. It doesn’t cover every story in the Bible, but gives a great overview. Story selections come from both the Old and New Testaments and include; Noah Builds a Boat, Baby Moses, Food from Heaven, Jericho, Queen Esther, Mary’s Gift, The Betrayer, Jesus is Coming Back, and so many more. Each story takes up two pages of the book. One side of the page has the story written in easy to understand language along with where in the Bible the story is found. The other side of the page is a full color picture depicting part of the story. AJ really liked the book because it was written in such easy to understand language. She was excited to be able to read and understand the Bible stories and really enjoyed the fact that they were not watered down. After reading the story in 101 Bible Stories from Creation to Revelation, she was then able to read the same section in her own Bible with better understanding. It is the perfect story book for young independent readers. The illustrations in the book are gorgeous and really add to the stories. The book is available from ZonderKidz and retails for $12.99. If you are looking for a new book that is more in-depth than a Picture Bible this may be a good buy for you. I think it makes for great bedtime reading. I believe that the Bible is the infallible and authoritative written word of God. When I was younger I was in Missionettes and memorized a lot of different Bible verses. The longest thing I had to memorize other than the statement of faith was 1st Corinthians 13. It was just one chapter but it took me a few weeks practicing every day. Once I finally knew it though I really knew it. I can still recite it today if I look over it for a second. I think memorizing the Bible is very important, unfortunately it is something that I haven’t made a big enough priority with AJ. 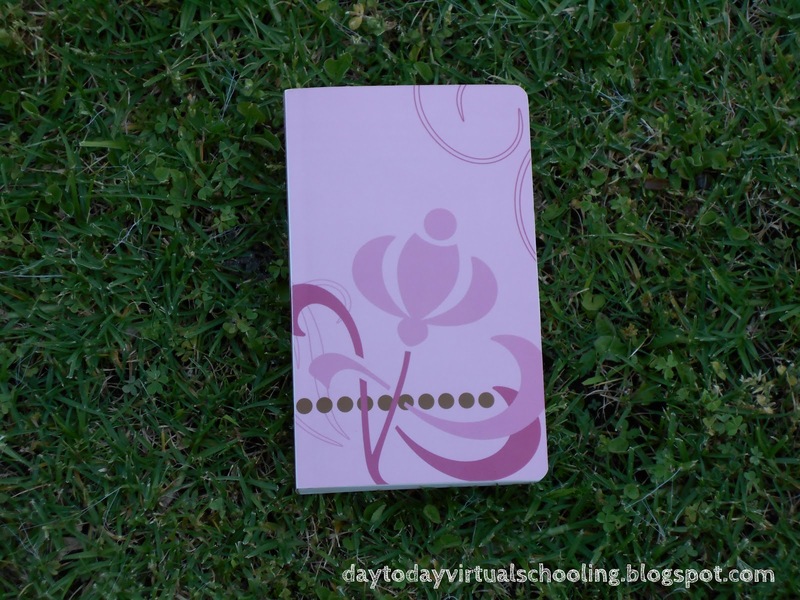 I was given the opportunity to review Bible Memorization made Easy written by Kimberly Garcia, the same author that created the Write Through History Series that I reviewed a few months ago. The books are available in an E-book format for $15.99 or a printed book for $21.99. “Finally, brethren, whatsoever things are true, whatsoever things are honest, whatsoever things are just, whatsoever things are pure, whatsoever things are lovely, whatsoever things are of good report, if there be any virtue and if there be any praise, think on these things.” Philippians 4:8 has always been a favorite verse of mine so we decided to review Memorize Philippians. On Day two, students read the passage. Immediately following, the passage is rewritten with approximately 25% of the words omitted. You fill in these missing words from memory. This program is geared for grades 6 and up, AJ is in 5th grade but we decided to give it a try any ways. While I love how easy the program is to use and think it would work perfectly for a visual learner, it just wasn’t the right fit for my hands on learner who doesn’t like to write. She is a child that needs to move, have music, and really understand what she is memorizing. Philippians has a lot of vocabulary that was just too difficult for her since the King James version is used. To be honest the amount that she saw she was going to memorize overwhelmed her a lot and she didn’t have her heart in the memorizing. In the past she has only memorized small verses here and there so I think that trying to memorize so much at one time was a bad idea that I should have thought about prior to agreeing to review this product. I think this would be a great program for older students who have done some Bible memorization in the past. The way that the author has the program set up makes it easy to use; you don’t even need the Bible because everything is already written in the book. For the more disciplined student who has a desire to memorize an entire book of the Bible, this would be a wonderful tool. For this particular study I would actually recommend the E-book version over the printed book, if your child needs a little more time working on a section you can easily print extra sheets for them to work on. That is one of the great things about this program. If you need to slow down and take longer on a section you can. It is very flexible and lets you move at your own pace. Overall it did not work for my hands on learner, but I think it is a great product that is well written and would be helpful for the older child or those who are visual learners. 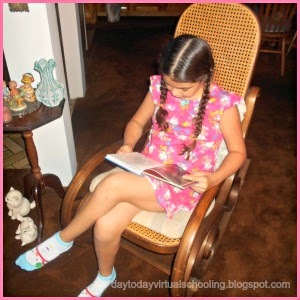 Some of the other reviewers had amazing results there is a wonderful video at Hopkins Homeschool that shows how one child had incredible results! Find out what other reviewers had to say by clicking on the graphic below. When I was younger I read the entire Bible and felt like it was a huge accomplishment. For some time now I have not been reading the Bible as much as I should. Then this year AJ’s curriculum included daily Bible reading. I have been reading more of the Bible again but felt I could use a good Bible study. So when I was recently given the opportunity to review two books by Heather A Kendall I thought that it would be a good study. 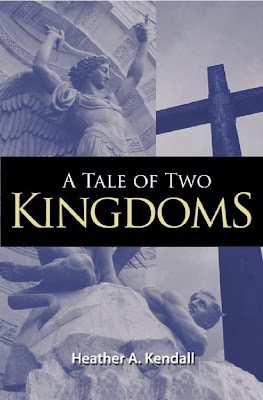 I reviewed A Tale of Two Kingdoms and God’s Unfolding Story of Salvation. The books are meant to be used either together or they can stand alone. A Tale of Two Kingdoms is a 448 page book that is divided into two sections. The first section is, Waiting for the Promised Seed and the second is Responding to the Promised Seed. The promised seed is of course our Savior Jesus Christ. The book traces the story of salvation from Genesis to Revelations. The book also includes maps, timelines, and key people and events in the Bible. The book is meant to serve as a big picture overview of the Bible. To be honest this book was just not for me. Throughout the book Heather tells stories of her own life and it is intertwined with the Bible study. I found it not only distracting but at times confusing. Everyone interprets the Bible differently and I found a few places in the book where her interpretation of scripture and my thoughts on scripture differed. While I love the idea of the book I felt it was hard to read and at times boring. The book was not all bad, and it could be that it was not right for me at this time in my life. I do agree with the general premise of the book and feel that it might be a good starting point for those who are either new to reading the Bible or those who want to understand the big picture of the Bible before studying it more in-depth. The second book was God’s Unfolding Story of Salvation. 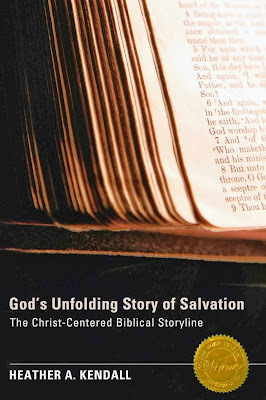 God’s Unfolding Story of Salvation is a 196 page Bible study that is divided into 38 lessons. The lessons are divided into four sections. This book can be used for a group or individual Bible study. The same premise is presented in this book, but the difference is that you are instructed to read various verses in the Bible and then answer questions. After the questions there is a summary of the verses along with Heather’s interpretation of them. It is suitable for older teens and adults. While I found this book more useful than the other one, it still was not something I would use. The way the questions were set up requires a lot of writing and some of the questions were quite redundant. They also have you jumping all over the Bible reading a few verses here and there. While I don’t think the Bible has to be read from beginning to end, I do feel that reading little bits here and there can lead to misinterpretations of the scripture. In a Bible study I like questions that are open-ended and make you think, unfortunately those were not the types of questions I found. I felt the questions were set up more like reading comprehension questions than ones that made you think and grow closer to God. All that being said, if you are looking for a Bible study where the focus is primarily on facts in the Bible, this would be what you are looking for. It might be good for those who are new to the Bible and those who want the scriptures broken down and explained for them. According to the author the books can stand alone or be used together. After trying numerous times I was unable to match up the chapters so that both books were talking about the same thing. I would recommend using the books separately as they make more sense that way. Overall these books didn’t work for me. I love the idea behind the books but personally I did not enjoy them. Just because they didn’t work for me doesn’t mean they won’t work for you. Check out a sample from the books and decide for yourself. 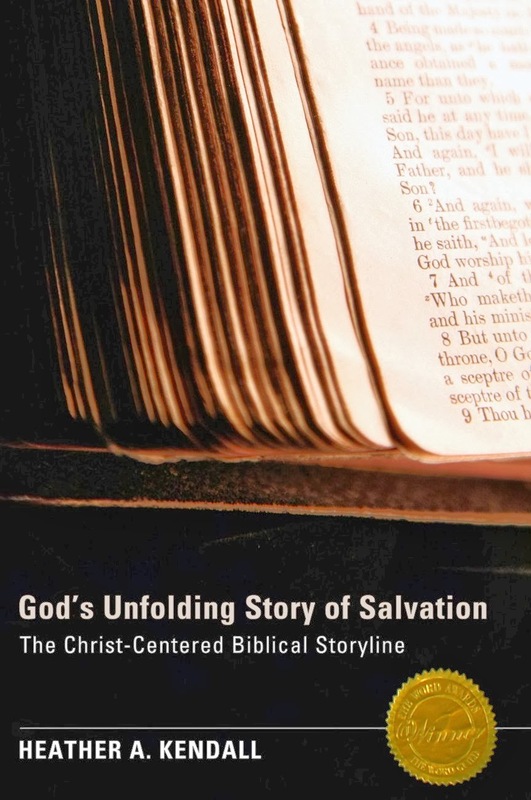 God’s Unfolding Story of Salvation is available for $22 with free shipping and handling from the author’s website and for $23 from Amazon. 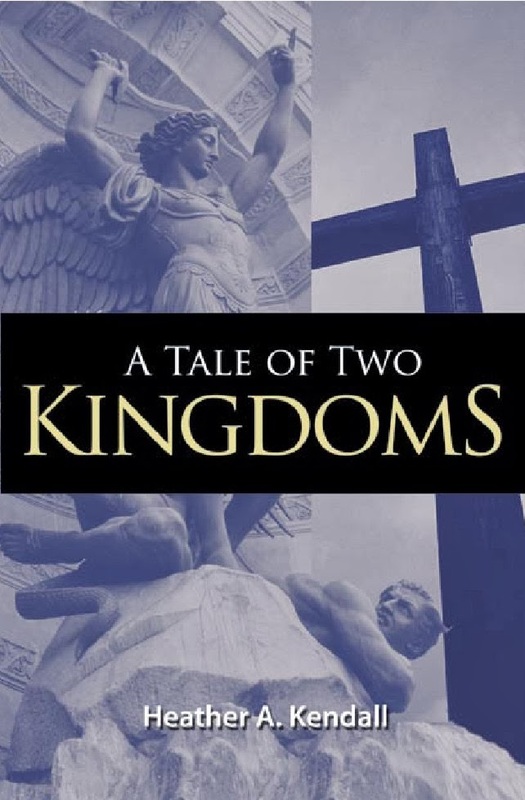 A Tale of Two Kingdoms is available for $23 with free shipping and handling from the author’s website and for $19.17 from Amazon. It is also available for Kindle. Find out what others on the team thought of the books by clicking on the graphic below. This year is the first year that we are studying the Bible as part of school. We were using the King James Bible, and while I usually understand what the verses are saying, sometimes I have a hard time explaining the verse to AJ. After asking around in a few different homeschool groups I was given a list of a variety of different Bibles geared towards kids. I didn’t want a story Bible, but a Bible written in easier to understand language. After looking around the one that I really liked and would like to get for AJ is the Deep Blue Kids Bible. Right now a new Bible isn’t in our budget, so I continued to look for other resources. I came across BibleGateway.com it is amazing. You can type in any chapter, verse, or even an entire book of the Bible and then read it in many different versions. They have quite a few different versions in English available along with other languages. I really like how you can see the same verse is so many different versions, from the Message to NIV to the Living Bible and the New King James. Most of the time the verses have the same idea but the wording is easier or harder to understand depending on the version. There are also different devotionals, verses of the day and email subscriptions available. The best part is that the website is FREE! We have been reading the verses out of the King James Bible and then looking them up on the web site if she isn’t understanding something or needs more clarification. This has turned reading the Bible verses into something she likes to do instead of a chore because she is able to understanding what she is reading. It has also helped to show me which Bible versions I would and would not like to purchase in the future. Check out the site if you are looking for help teaching Bible to your little ones or if you would like more clarification for yourself. **** I am not affiliated in any way and did not receive any compensation from BibleGateway.com I am just sharing a great resource that I found. I am blogging through the alphabet with Ben and Me check out what others have to say. When I think of the Bible, I think of a holy book full of God’s word. I have had many Bibles over the year and in fact at the moment I have three of them sitting on my bookshelf. They are in fairly good condition because other than church they never really left my house. 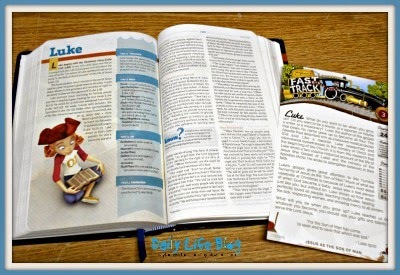 When I received a Waterproof Bible from Bardin Marsee Publishing to review, I didn’t exactly know if it was a product that I would use. The version I received was the King James Version of the New Testament, Psalms, and Proverbs. It has a very nice pink cover and is very well made. It is not the entire Bible but the small size would fit nicely into a purse or backpack. 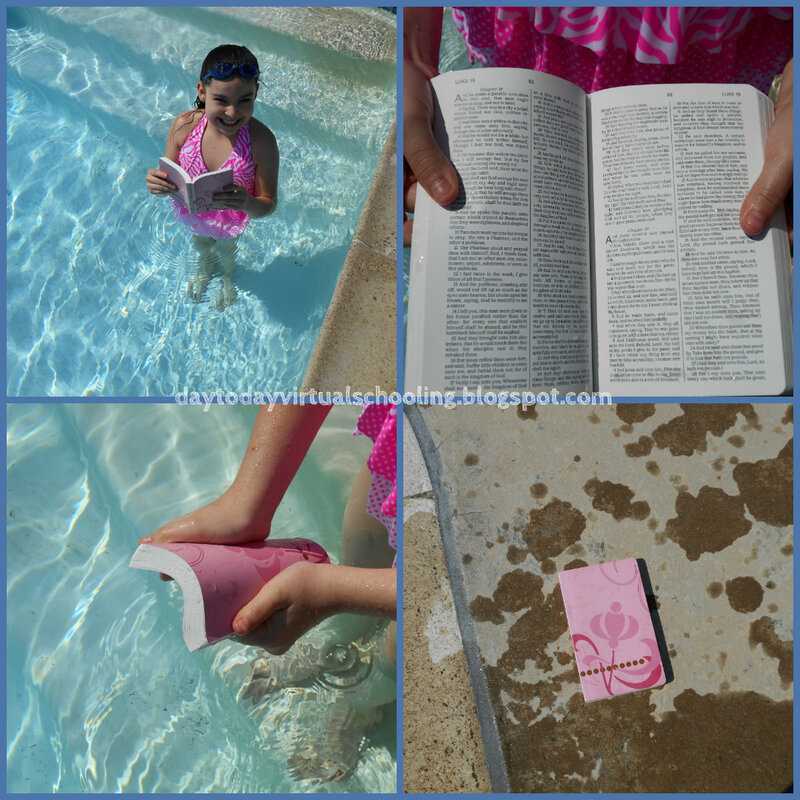 The Waterproof Bible is available in two forms. The amazing thing about this Bible is that it is WATERPROOF inside and out. It is stain resistant, and tear resistant. The synthetic pages of the Bible will stretch before they tear and to help ensure the durability, each page is sewed in and then glued. They say you can hold the Waterproof Bible by one page and shake it around and that the page will not fall out. We decided to test it out. This Bible is so well made that even with a little bit of pulling the page stayed intact. I didn’t know what to expect with waterproof pages, but they are beautiful. They are crisp and clear and the text is very easy to read. One of the things that I liked was the fact that I could not see the print from the backside of the page as I was reading. Since I received the Waterproof Bible I have dunked it in water a few different times, each time after it dried it looked brand new. Today was the first time we went swimming this year so we decided to take along the Waterproof Bible and test it out some more. AJ took it in the pool and the water just squeezed right out of the pages. As you can see the text on the pages is still clear as can be and the cover looks like new. The only thing I was disappointed with was the fact that the Bible sank to the bottom of the pool instead of floating. The new products do float but I received an older version, one that was printed before they made the change to the floating materials. 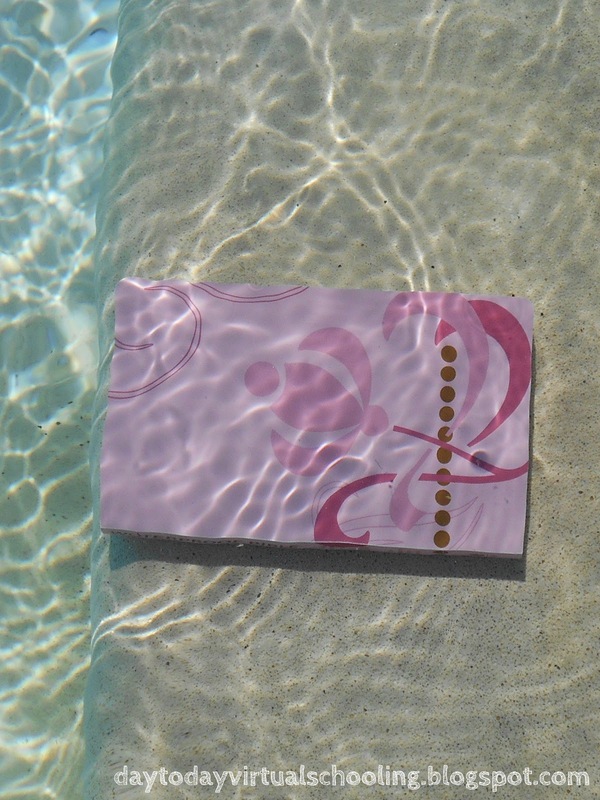 I have heard from many others that their Waterproof Bibles do float but ours didn’t. Overall I think this Waterproof Bible is a great idea. It is sturdy and will stand up to just about anything. For now I don’t have any major plans to use this Bible. It will probably sit on my bookshelf with the others, but I love the fact that if I ever have the need or desire I can take this Bible anywhere. I could definitely see this Bible being great for those who are the outdoor type or for people who want to put their Bible in a book bag and not have to worry about it getting ruined. Sunday school teachers, missionaries, and kids away at camp would also have great use of this Bible. If you are looking for a new Bible that is durable, stain resistant, and waterproof, then this is the one for you.